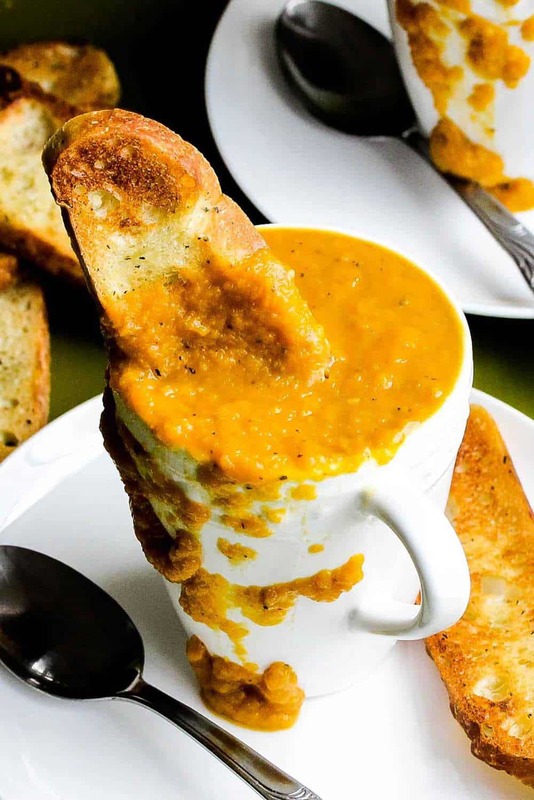 Roasted Butternut Squash Soup is about as comforting of a soup as you will find. It’s just so warm and wonderful any time of the year, but we love it during the holiday season. 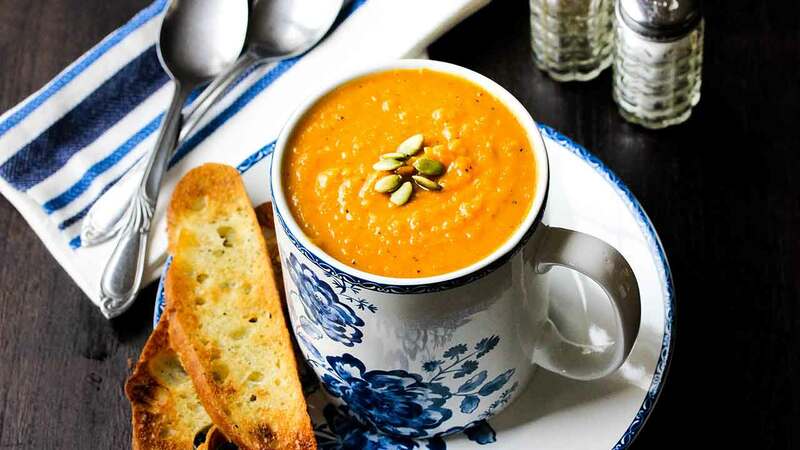 Oh, Roasted Butternut Squash Soup…you’re so good. Roasting the veggies brings out such incredible flavor. You can easily find pre-cut butternut squash in most supermarkets. This soup tastes like it took hours to make, but it’s very simple! 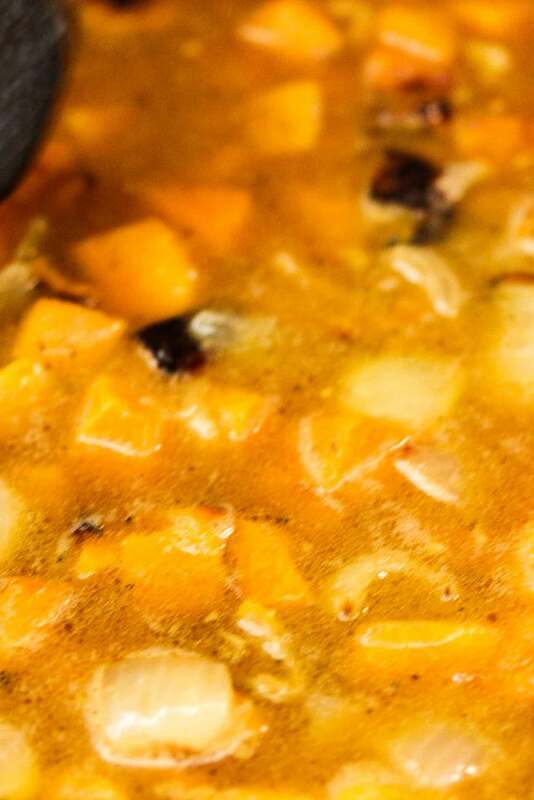 Just simmer the Roasted Butternut Squash to continue melding the flavors. This soup is not too heavy, too. It’s so creamy tasting, but there’s no cream used! The ginger and the touch of curry powder adds such amazing flavor. The smell of this Roasted Butternut Squash soup is heavenly. This is one soup you’ll want to make over and over. You know what’s another really delicious and comforting soup? Our Roasted Tomato and Basil Soup! 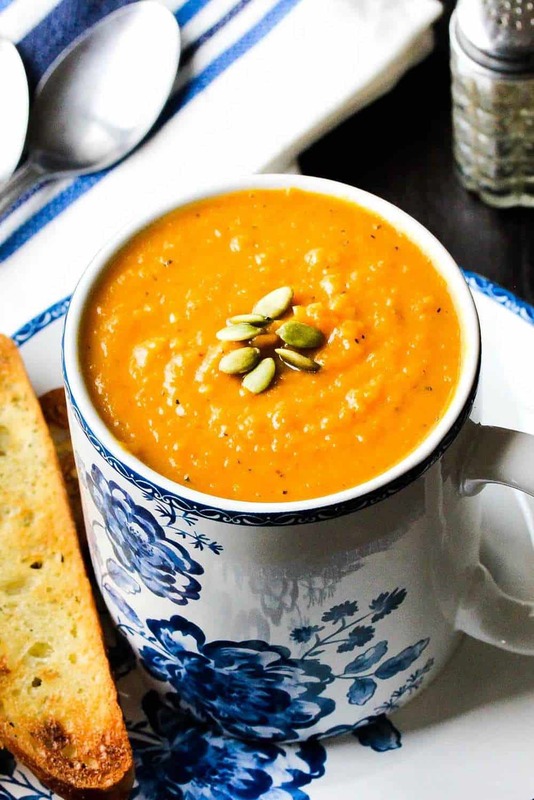 You can’t find a much more comforting soup than Roasted Butternut Squash Soup. Oh, you probably could…but this one is right up there with the best of the best. Its deep flavors are so wonderful. We just can’t rave about this soup enough. Your loved ones will thank you deeply for serving them this heartwarming soup. 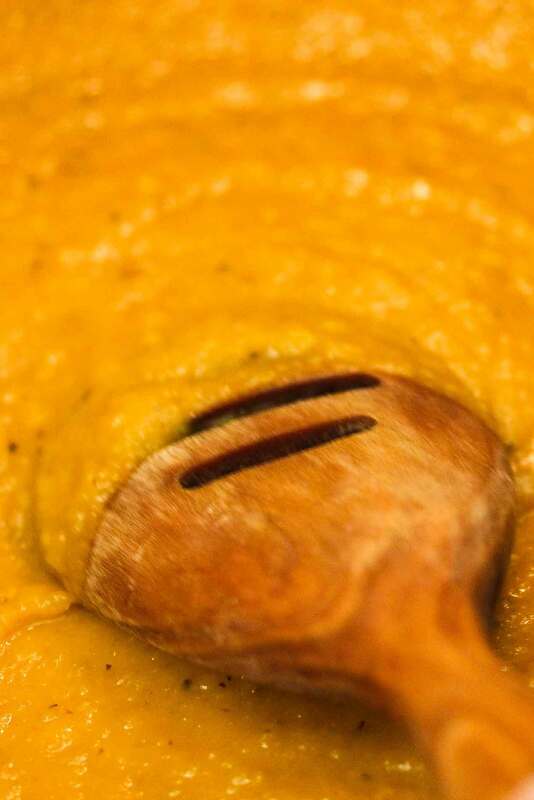 This Roasted Butternut Squash Soup has been a favorite of ours for as long as we can remember. the perfect soup when there is a chill in the air. Warms you right up. Just a wonderful flavor profile! 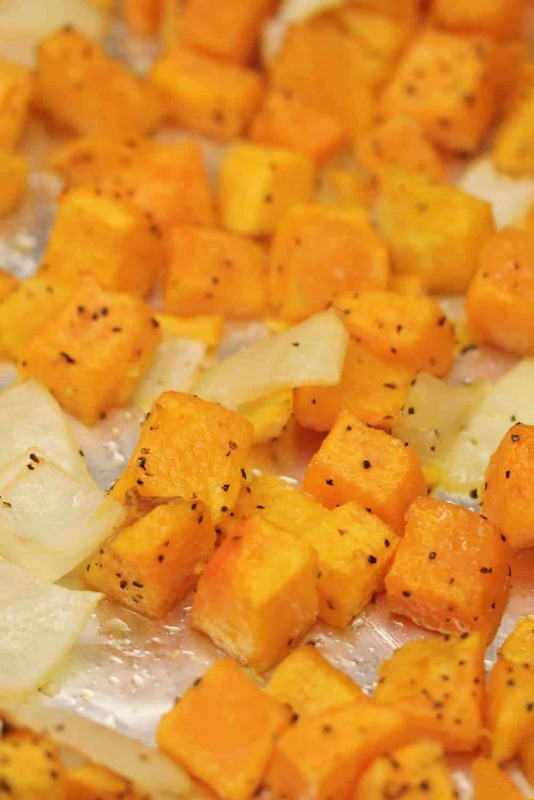 Place the squash and onion on two baking sheets. Toss with the olive oil and then sprinkle with salt and pepper. Bake for 45 minutes, tossing occasionally, until tender. Once the squash and onion are out of the oven, heat butter over medium heat in a large skillet. Add the garlic and ginger and saute until fragrant, about 3 minutes. Stir in the roasted squash and onions. Add in 4 cups of the stock and simmer for 20 minutes. Puree in blender, or food processor, until smooth (be careful, liquid is hot!). Return to the pot and stir in the remaining 2 cups of stock. Add 1 1/2 teaspoons of Kosher salt. Add curry and mix. Cook until heated through. exactly and didn’t change a thing! 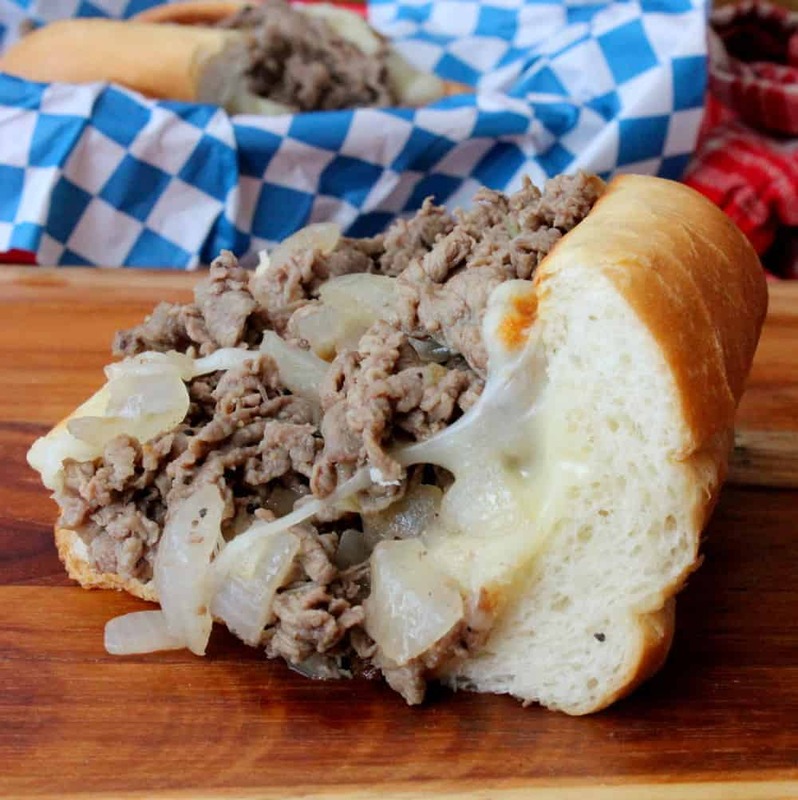 Thank you for this comforting recipe. I’m impressed by your writing. Are you a professional or just very kneogwdleable? Hi Lucy, approx. 3 lbs would work great for you. I LOVE this soup! I have made it a few times now, including tonight! It’s honestly one of the best soups I’ve ever had. Very well done. Happy Holidays! This soup is Amazing!! Talk about flavor! Five stars to you chef! Thank you, Katie! So glad you liked it. It’s one of our favorites for sure!! Keep letting us know what you think!! A really good answer, full of raiyinaltto! 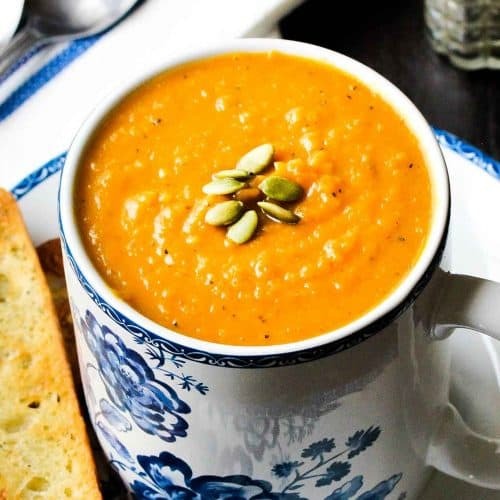 I love butternut squash and this soup looks fabulous. I think this is comfort food at its best! Couldn’t agree more, Kathy! We have loved butternut squash soup for years. I love roasting the squash to really bring out the flavor. Love http://www.beyondthechickencoop.com!! Stay in touch! I can’t wait to try this. I’ve never had butternut squash soup! And BTW..you two definitely make me smile, your happiness is contagious!